The three groups of Hutterites are situated exclusively within the breadbasket or prairies of North America. Hutterites have subsisted almost entirely on agriculture since migrating to North America in 1874 which helps to explain their geographical locations. All Schmiedeleut colonies are situated in central North America mostly in the province of Manitoba and in South Dakota. There are a handful of colonies in North Dakota and Minnesota. The Darius and Lehrer -leut are situated in western North America, mostly in Saskatchewan, Alberta, and Montana with a sprinkling of colonies in BC, Washington and Oregon. 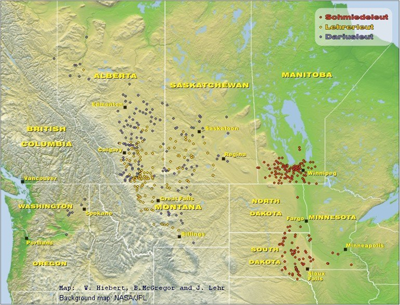 Most colonies are located in the Alberta (168), followed by Manitoba (107), Saskatchewan (60), and South Dakota (54). A total of 462 colonies are scattered throughout the plains of North America. The total number of Hutterites in NA hovers around 45,000. Approximately 75% of all Hutterites reside in Canada, with the remaining 25% in the USA. The map below shows the distribution of Hutterite colonies in North America.